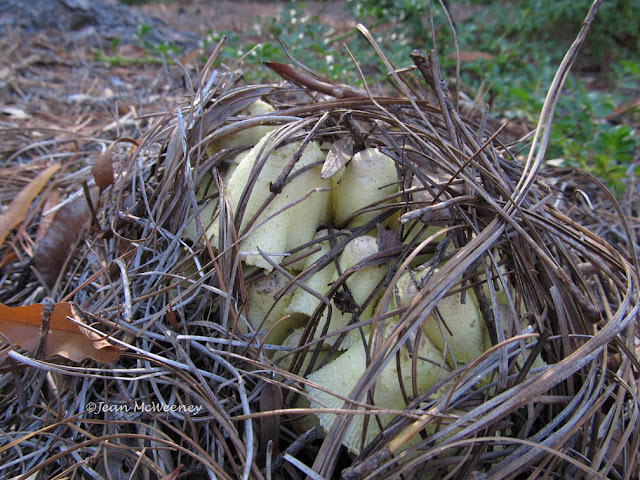 Dig, Grow, Compost, Blog: I'm Back! And Where Did Summer Go? I'm Back! And Where Did Summer Go? Near the white cosmos I planted some iris transplants and then set up a sprinkler to settle them in. 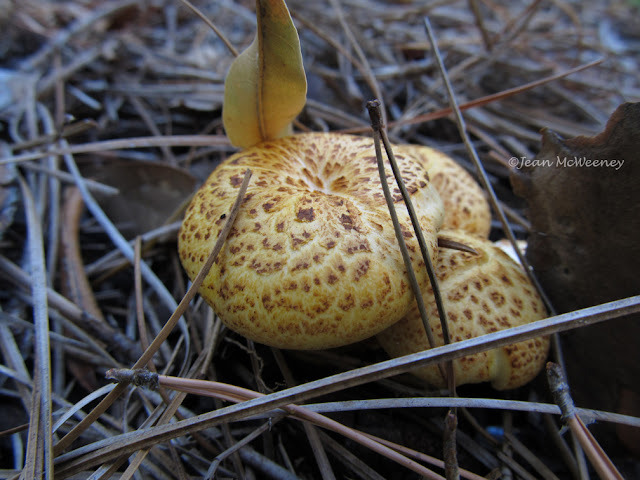 The next day I had an explosion of different types of mushrooms. It's amazing what a little water will do! The squirrels are driving me crazy with their digging. 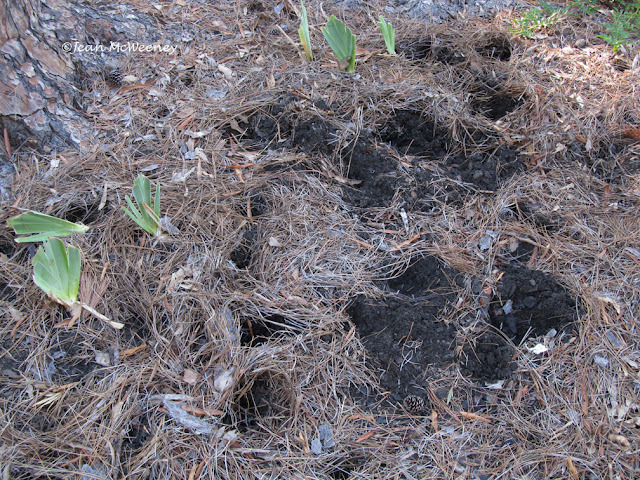 The photo below shows why I can't plant bulbs right now. I have a lot of open areas in the bed I put in last fall since the plants haven't filled in yet, and the squirrels really like that. So last weekend I started making rodent proof guards for the bulbs I'm going to plant. I cut chicken coop wire into sections and fasten them on top of the soil with landscape pins. Then I cover them with mulch. It's some trouble but worth it. 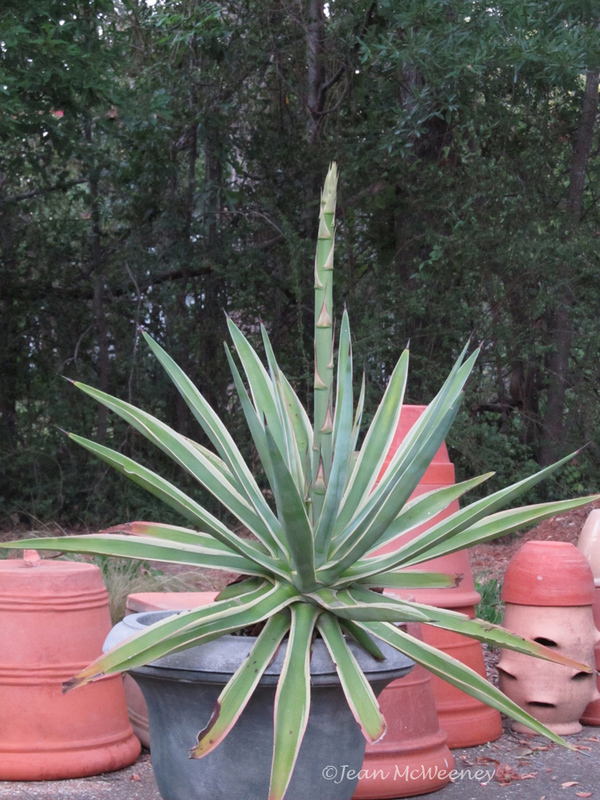 And here's a fall surprise - a bloom stalk on my agave. Since this photo was taken, the stalk has doubled in height. I do hope the blooms open before a hard freeze. But I guess the plant will die after blooming, and I'm OK with that since this agave has been too tender for me, and thus a hassle to protect. 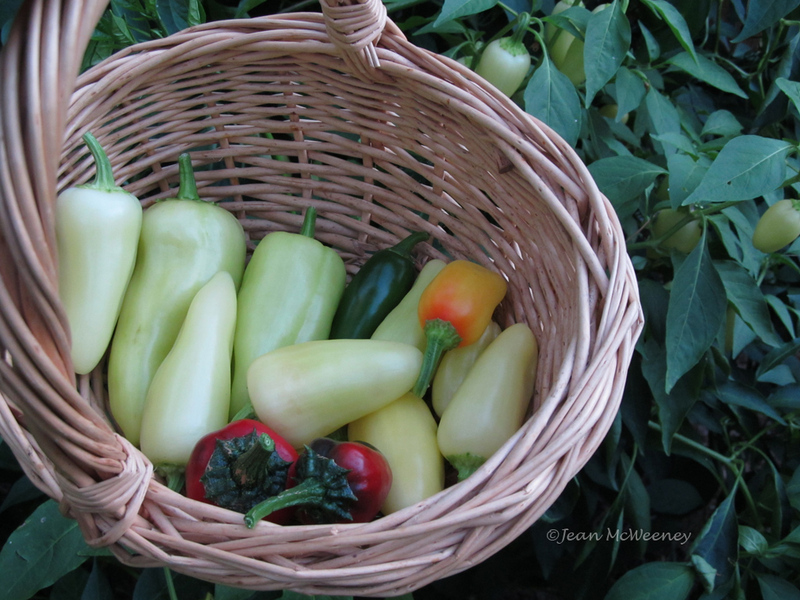 Fall has brought a bumper crop of peppers. 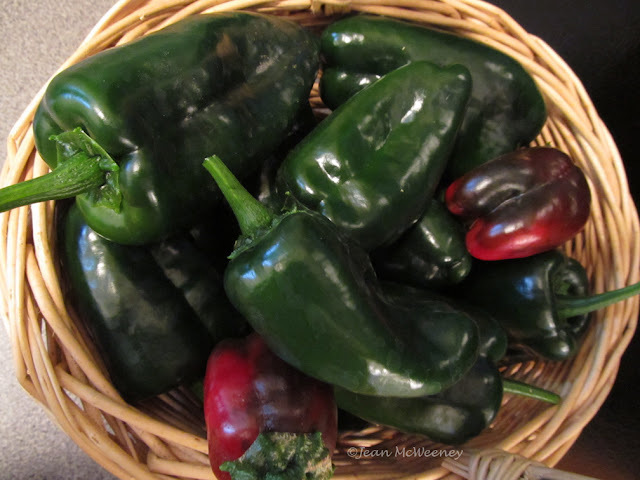 Last spring I got carried away with all the pepper varieties The Natural Gardener had, and I came home with five pepper plants and not really enough space to plant them. So I crammed them all into one area and now have a strange mix of slightly hot sweet peppers and truly hot, hot peppers. The Mariachi pepper, which is supposed to be only mildly hot, causes my husband's eyes to water. If you know him, that's saying a whole lot (the man can finish a jar of ghost pepper salsa in two days all by himself). Last weekend I picked a bunch of poblanos, roasted the whole lot and froze half of them. I find the easiest way to roast them is to throw them on the grill. I'm glad I took this photo of my little pond a couple weeks ago because the water lilies are now slowly putting themselves into winter hibernation. In the stock tank pond I have a blue rush, miniature 'Helvola' water lilies that Pam of Digging gave me, and my sweet little glass floatie ball I brought back from my Seattle trip. 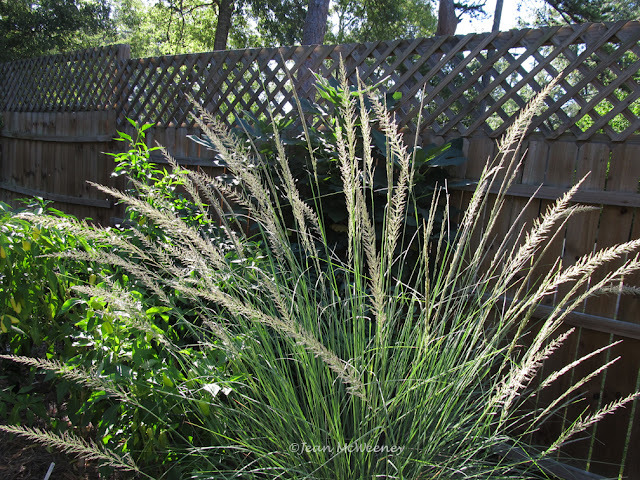 And at last, one of my favorite things about fall is when the grasses start to bloom. I have quite a few blooming now: 'Northwind' switchgrass, pennisetum, 'White Cloud' muhly (which I must get a photo of to show you), pink muhly, and this muhly grass commonly called Lindheimer's muhly. Here it's not quite in full bloom. It's fairly big - about 4 by 4 feet. I love it. And how could I not show a photo of the pink muhly? It looks so luscious, like a frothy ice cream treat. I hope never to be so tardy with my blog posts. See how an entire season faded away and another appeared in just these past two months? Oh my - love those pictures of the muhlies. They do look luscious! And I'm jealous of your little stock pond - it's so precious. Doesn't a little fall weather feel good after all this heat? And suddenly I find myself blogging a lot again. I love your mushroom explosion, Jean, how delightful! It is all looking very beautiful, especially the muhly grasses. We have Lindheimer, new this year and love it, too. I want to share with you my newest anti-squirrel digging trick, little whirlygigs, the child's toys. Fifty cents in the toy section at Walmart. I read that the movement and reflective quality deters rodents. I bought a bunch and stuck them around the area with the worst digging. So far, so good. I know how hard it is to keep blogging when you are busy, but I'm so glad you're back, Jean! I'm glad you had at least a few blooms from your 'Sonata' cosmos. 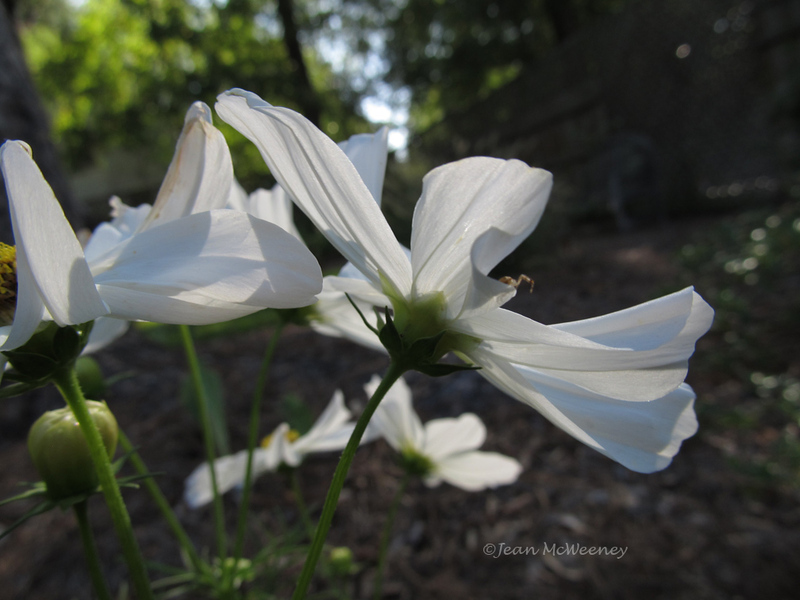 Isn't it funny how plants can respond so differently in other gardens? My cosmos did so well this year in spite of the drought, but my peppers were a no-show. Outwitting those pesky squirrels sounds like a lot of work--hope the chicken wire does the trick. And oh that Muhly grass--I love it! I was wondering why I hadn't seen a posting in a while. I am excited to see the agave and hope it flowers. I would be dragging it in the garage, in case of frost, to make sure I got to see the bloom. I know what you mean about the trouble of keeping it but it pups so much that I just pull the smaller ones out of the ground and save them over the winter. They don't seem to mind. I don't have the pink muhly but I notice there is very little flowering around here. Usually there are seas of pink. What beautiful fall colors in your grasses now that you've gotten a little cooler weather. I love your pink grasses, they look like upside down ballerina tutus. And I really like your pond, I don't remember seeing it before in your posts. Don't feel bad about not posting - my last post at Gardening for Nature was in April. I've found it very hard to keep that one up since I write each Sunday (well most Sundays) at Wildlife Garden. You've given me a giant nudge now to get my self moving and post on my own blog, so thank you! Your pink muhly is stunning, as are Frances' at Fairegarden. Like Rock Rose said, there is very little pink muhly in Austin this year, and normally there's a lot. The drought was just too much for it, I suppose. I'm glad to see your Helvola is doing well. It looks nice contrasted with the blue float. 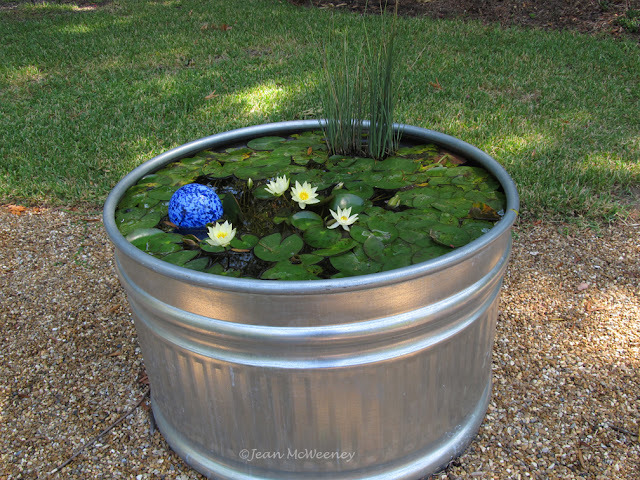 I love that little stock-tank pond! 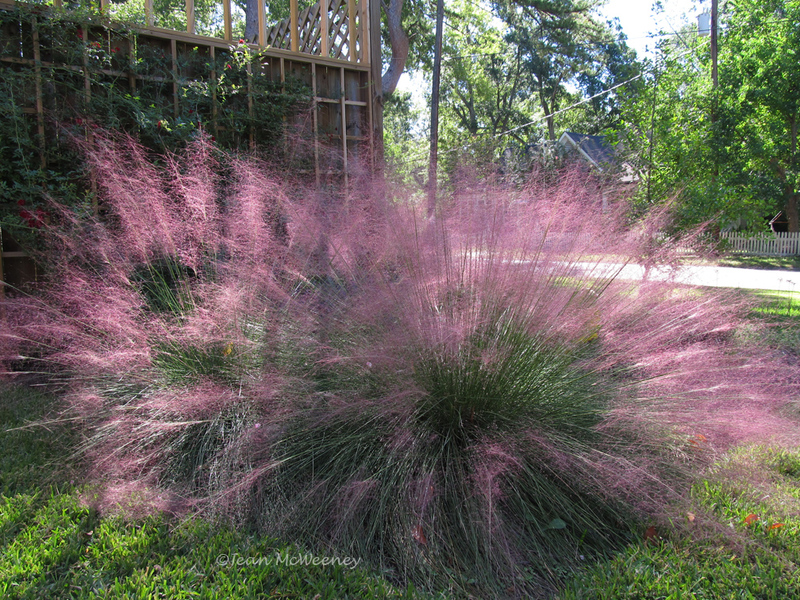 That last photo of the Pink Muhly took my breath away! I can only hope mine look that good someday! BTW Love the pink muhly! Have fun enjoying this cooler weather.